Now that I’m done with Stonyfield for good, I’ve purchased a couple of tubs of different yogurts that are made with milk that has not been homogenized. I’ve eaten Sugar River Dairy’s Plain Whole Milk Yogurt twice this week for breakfast. Sugar River Yogurt is made in Albany, WI. They do not claim to be organic, but say that their yogurt is crafted from Grade A milk produced from pasture grazed cows on a local family farm. The ingredient list is as follows: Non-homogenized Grade A Pasteurized Milk, Nonfat dried milk, contains active cultures including I. Acidophilus, Bifidus and Casei. The nonfat dried milk might give some pause due to oxidized cholesterol, but this does not concern me since there isn’t significant cholesterol in nonfat milk in the first place. I think this is the route Sugar River has gone to thicken their yogurt. Stonyfield contained pectin. I understand that many who make homemade yogurt find that homemade yogurt is runnier than commercially available yogurt and this may be why. The yogurt tastes good. When I opened the package there was a thin layer of cream on the top. The second day, there was only minimal separation of whey from yogurt. It appears to me that Sugar River is doing everything right. They are local, while not organic, their cows eat grass. I’d rather have my yogurt come from cows eating grass than cows stuffed full of organic grain. I’ve also been shopping for local vegetables, meat, eggs and milk either directly from the farmers or from local stores. I don’t know why I hadn’t thought to try a more locally produced yogurt earlier. 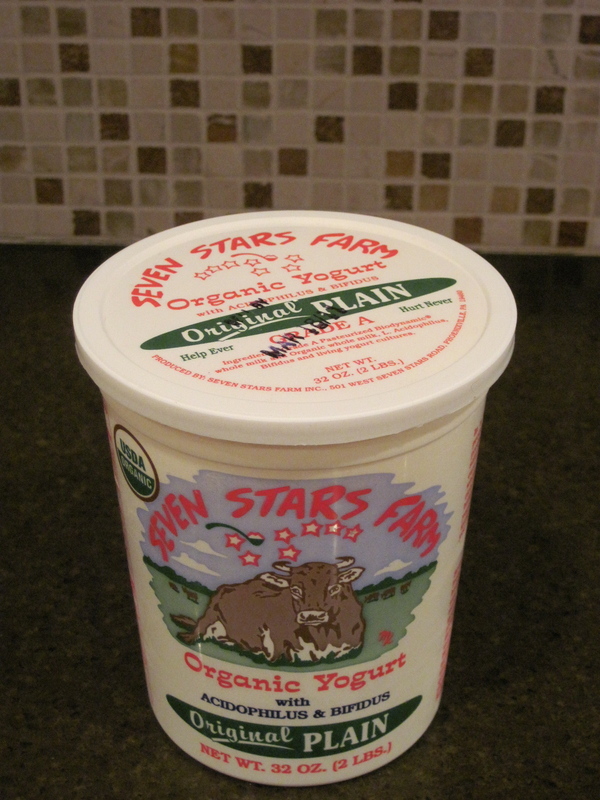 I’ve also tried Seven Stars Farm Original Plain yogurt from Phoenixville, Pennsylvania. It appears that Seven Stars is distributed more widely than Sugar River. Seven Stars Farm is located on 350 acres of land and they employee Biodynamic farming methods. Their packaging goes on to describe good farming methods including grazing from early spring to late fall and sustaining good fertility of the soil using crop rotation and farm composts. They say that they may use milk from neighboring Biodynamic and organic farms during times of high demand. Their yogurt contains only Biodynamic and/or organic whole milk and several live cultures. There was definitely a layer of cream on top when I opened the package. This yogurt is a bit lumpier than other commercial yogurts that I’ve seen, though I understand this is much more like home-made yogurt than something with a very uniform texture. It has a tangy taste and if I lived in Pennsylvania, it would definitely be my choice. I think I’ll stick with Sugar River with Seven Stars as a backup, but I’m still going to sample my way through all the cream top yogurts that the Willy Street Coop carries with the exception of Brown Cow, which I guess I might buy if I had no other options, but it is a Stonyfield product and at this point I have no interest in supporting Stonyfield and their evil overlords at Groupe Danone. My typical breakfast, inspired by the yogurt with fruit and granola at Macy’s in Flagstaff is back on track with good yogurt, a sprinkle of organic raw cacao nibs, half a cup of frozen fruit (or fresh fruit in season) and topped with about 1/4 cup of my home-made granola which is my best take on the awesome granola that they make at Macy’s. I’d eat their food more often, but it’s usually impractical to travel 1600 miles for breakfast. Disclosure: I purchased all of the yogurt reviewed in this post. I received no compensation of any sort from Sugar River Dairy, Seven Stars Farm or Macy’s European Coffeehouse in Flagstaff, Arizona. I would not however, say no if they wanted to give me a free latte the next time I’m in there eating their yogurt with fruit and granola or any of their other great food. This entry was posted in Uncategorized and tagged Yogurt. Bookmark the permalink. Glad you’re back on track with local yogurt. Your rave review of Macy’s granola has inspired me to place an order for a pound from their website. 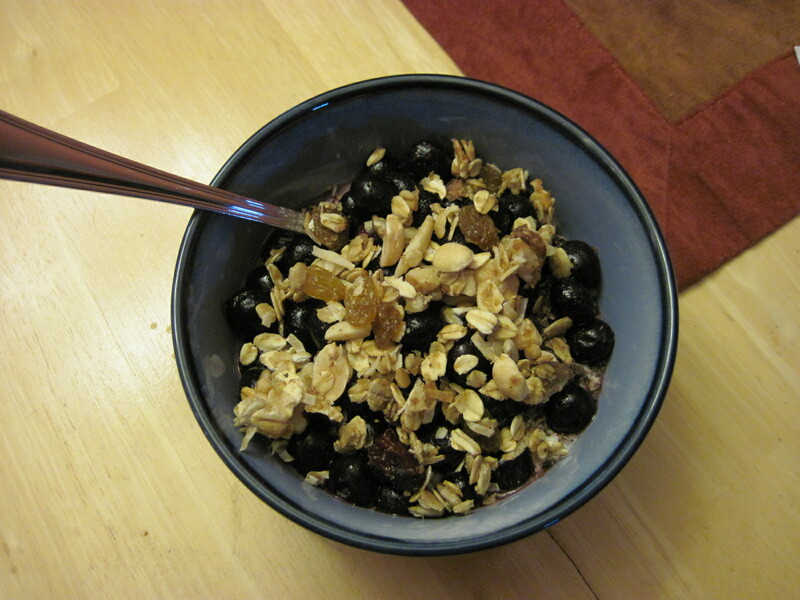 Yes, I know – big carbon footprint for granola, but if I do it just once, I’ll not drive my car for a few weeks, hopefully that will make it better. Oh my. Well, those trucks were probably going that way anyhow. I’ve never bought their granola online. I used to buy what Brennan’s carries. But it just cost too much and I figured that I can do better. When you’re here in a couple of weeks, I can give you some of what I make. As far as Macy’s goes, we’ll be within a county or two of there soon, but probably not in Flag for breakfast if at all. Really hard for me (but not Deron) to go to AZ and elude Flagstaff’s siren song. I read this post and your post about Stonyfield yogurt. I used to buy Brown Cow, then Whole Foods stopped carrying the kind I was buying, so I switched to Nancy’s. Then, one day they were out of Nancy’s, and I had to look for another, so I got Seven Stars. I noticed a huge difference. Seven Stars is very runny, but I decided I need to stick with it because it is the only one that is organic, and does not have dried milk, pectin, etc. Also, according to the label, it is non-GMO, and the milk comes from pastured cows (seasonally). Nancy’s has dried milk in it. Once this past summer, I was out of town and had to buy yogurt, and the store I went to did not have my yogurt, so I got Stonyfield. It was the best choice available. Right away when I opened it, I noticed that the quality seemed poor – it seemed jelly-like, and I’m sure it was the pectin they add. I was disappointed but now I know from this experience what pectin does to it and will avoid it in the future. It’s just another example of food companies that degrade and dilute the quality of their products with low-grade fillers and preservatives. I suppose some customers don’t care what is added to make it a thicker yogurt, but to me, it just looked like it was poor quality. I bought Seven Stars Farm whole milk yogurt today and it was consistently creamy throughout without stirring or shaking, so I’m wondering about their suppliers. I don’t want homogenized fat. That doesn’t make sense to me. I buy 3 containers of Seven Stars original plain whole milk yogurt each week, and every time, there is a layer of fat on the top that I have to stir in. It takes me a long time to stir it before it is smooth. I have never gotten a container that I didn’t have to stir. mj, I agree completely. From the last time I bought 7 Stars. It’s been a while, but I remember it as just about the best yogurt in the world. 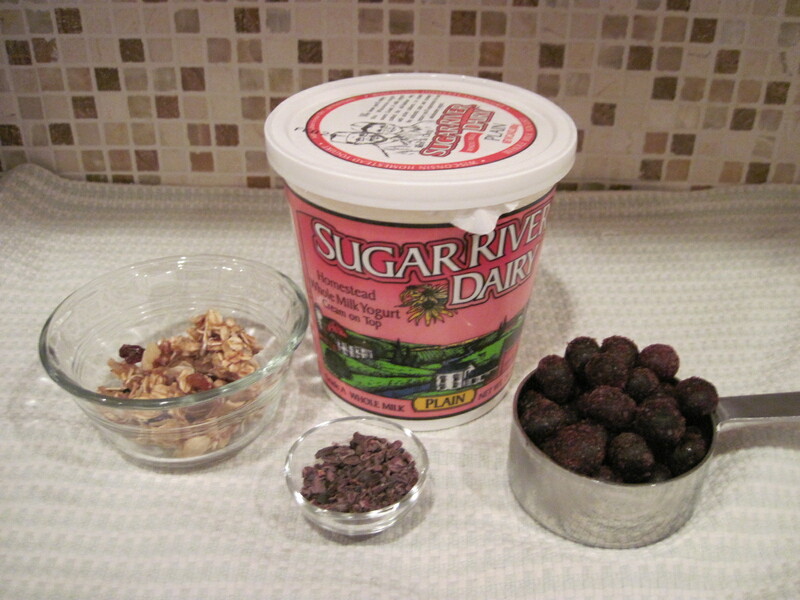 Sugar River Dairy is close to me, and their’s is very good, so that is all I buy unless the co-op is out. Another delicious yogurt is Butterworks. I mix their skim with Seven Stars whole, because I love the cream on top of 7-stars, but am trying to lose weight, and a cup full of 7-stars is too caloric! Try Butterworks it is very eco-correct! I found Seven Stars Farm yogurt about a year ago and have been happy not to be ingesting a bunch of junk. It tastes great and I use the plain as a starter when I make my own yogurt. I live a state over from PA so I feel good about buying it too. Macy’s granola sounds so good! I’ll try your recipe. I like making “to go” breakfast in mason jars layering granola or plain oats and other random stuff around the kitchen like chia seeds with yogurt layers and homemade preserved the night before. Yum.